Proper dental hygiene is an extremely important but often overlooked part of pet healthcare. When your pet has a healthy mouth they are less prone to other issues such as peridontal disease or issues with the kidneys or heart. As plaque and tartar build up the gums become weak and bacteria can breach the membranes easier and enter the bloodstream. As the bacteria circulates in the bloodstream inflammation is triggered throughout the body. This inflammation can severely damage tissues such as blood vessels, the heart and other organs. Here at Montana Veterinary Hospital we recommend dental cleanings every other year starting when your pet is around four years old. Dental cleanings allow us to deeply clean your animal’s teeth; removing tartar and plaque and checking for any abscessed or damaged teeth. Once we are done cleaning we then polish the teeth, putting a protective layer back on the teeth to help avoid more tartar build up. At home it is important to maintain your pet’s teeth. Regular brushing with pet specific toothpaste is an effective way to keep tartar and plaque at bay. If brushing is too much of a challenge, encouraging your pet to chew on harder treats and toys is the second best option. For more questions feel free to call us or come in for a visit and have us check out your pet’s teeth. 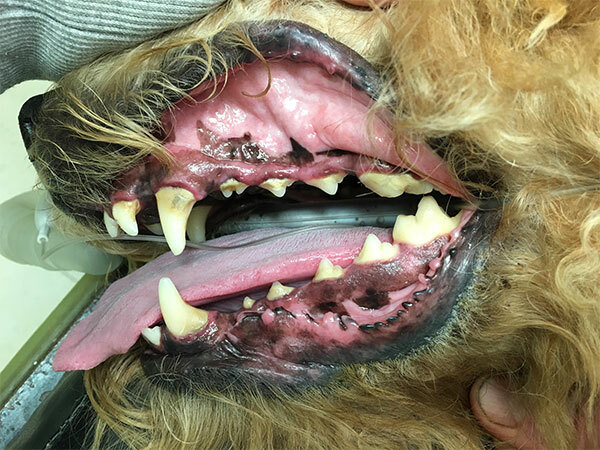 The below pictures show a dog with moderate tartar build up before a dental and after the dental. Notice the teeth look much cleaner especially up near the gum line.